Aleksandra Ekster, Venezia, 1915 © Archives Exter-Lissim, Association Alexandra Exter, Paris. Kraftwerk © Peter Boettcher / Kraftwerk. Courtesy Sprüth Magers Berlin London. 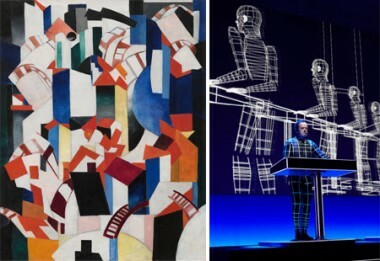 Moderna Museet opens its 2014 art season with the exhibition Dance Machines – From Léger to Kraftwerk. The exhibition focuses on the modernists’ fascination with the machine and mechanised everyday life, and how Kraftwerk has explored the relationship between man and machine in multidisciplinary projects. Dance Machines – From Léger to Kraftwerk opens on 22 January. The exhibition Dance Machines – From Léger to Kraftwerk presents some 50 works from the Moderna Museet Collection together with seminal works on loan from other institutions, including Dansmuseet in Stockholm and Centre Pompidou in Paris. The exhibition includes paintings, photography, drawings and moving images from 1911 to 1934, along with unique photogravures from 1887 by Eadweard Muybridge (1830-1904). Dance Machines also features works by artists such as Giacomo Balla (1871-1958), Aleksandra Ekster, Viking Eggeling (1880-1925), Fernand Léger and Francis Picabia. As an extension of the exhibition at Moderna Museet, Kraftwerk will give exclusive concerts at Cirkus in Stockholm on 21-23 January. The concerts are organised by Live Nation. The exhibition is supported by Deloitte.